The first country that comes to mind when we think about soccer is probably Brazil, the winner of the FIFA World Cup for an unprecedented five times. It is a country that is not only famous for the ball-kicking sport, but for its carnival extravaganzas, beaches, waterfalls, rainforests, and that it will be hosting this year’s Summer Olympics. However, Brazil, like many countries, also has a number of pressing issues that need to be tackled, most notably tourism safety and the Zika virus. Despite these problems, there are many exotic places to see in Brazil, specifically Rio de Janeiro, that are recommended for all visitors. One familiar landmark to many and a must-see is the statue of Christ the Redeemer, one of the New Seven Wonders of the World. 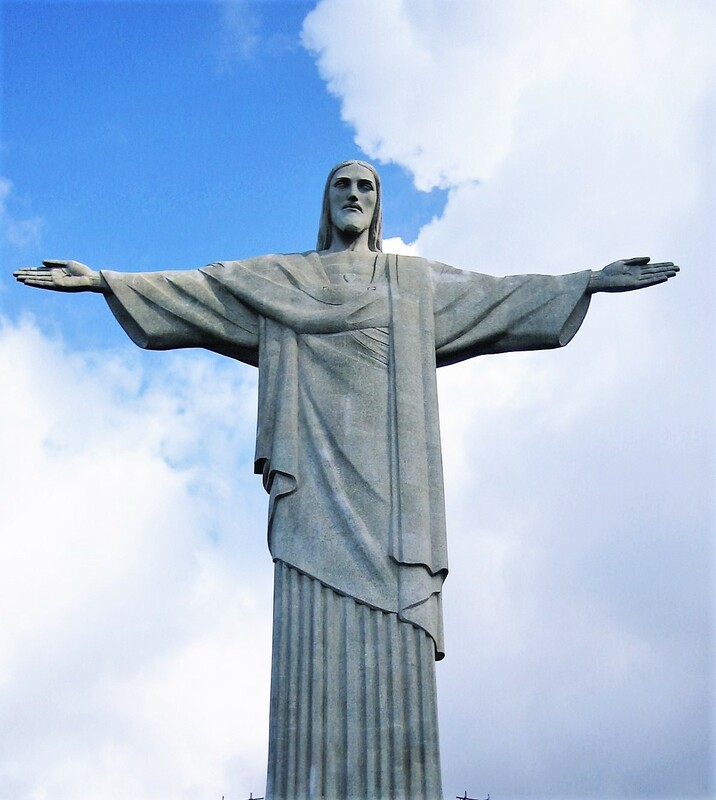 Christ’s open arms symbolize God’s protection and peace in Brazil, as well as representing a welcoming gesture. The statue is located at the top of the Corcovado Mountain in Rio. The 2,300-feet hill is accessible by a short railway ride. From the summit, there are incredible views of Rio, and the scenery is considered to be a natural beauty blessed by God. Rodrigo de Freitas Lagoon as seen from Christ the Redeemer. If you love hiking and sunsets, Sugarloaf Mountain is a perfect destination! The landmark gets its name from its similarity to refined sugar in a cone form. By taking a cable car and hiking up the mountain, you can experience a 360˚ view of the city. When the sun sets, the views are even more stunning, as the pinkish-orange sky adds to the serene environment. Its importance and beauty is probably the reason the mountains in Rio were the inspiration behind the design of the logo for the 2016 Summer Olympics. When we all settle down to watch the opening night of the Olympics, we will see the athletes marching into the huge Maracanã Stadium, which also hosted two FIFA World Cups in 1950 and 2014. It can seat up to 200,000 people, and there is also a soccer museum that includes Pelé’s jersey, the famous Brazilian player who scored his 1,000th goal at this very ground. Rio is also famous for its long beaches, particularly the Copacabana neighborhood’s breathtaking shoreline. During the day, you can enjoy the sun, sand, water sports, and go on a cruise across the sea. At night, you will be mesmerized by the dazzling, colorful fireworks, and the many festivities that take place there. This summer, near Copacabana, you can watch some of the world’s best athletes race for gold, as some Olympic events will be held there. However, do not walk along the beach at night alone, and avoid carrying expensive items. Rio is known for having mob thefts in the area with young local gangs who are eager to exploit tourists, so it is vital that you are vigilant at all times. View of Copacabana Beach from Sugarloaf Mountain. Ipanema is another neighborhood with gorgeous beaches. The main beach is a popular hangout area for the upper classes and beautiful fashion models. In contrast, not far from Ipanema Beach, there is the Rocinha favela, which is the largest slum area in Brazil. It differs from other countries’ slums because it is located on a hillside, and it offers great views from the mountain. There are 70,000 residents living in Rocinha, and they do not need to pay taxes. However, if you would like to catch a glimpse of their lives, you should not go alone. It is better to arrange an organized tour with a group as the area may seem unfamiliar, and there are policemen on patrol with rifles. There are numerous world-class attractions beside Rio. A two-hour flight from Rio will bring you to the roaring wonder of the 275 individual cascades that make the Iguazu Falls the widest and largest waterfall system in the world. The falls put on a stellar show of shimmering rainbows and misty clouds and can be experienced from either the Argentinean side or the Brazilian side, as 80% of the falls are located in Argentina. Whenever you take a walk along the falls, there is always a new and exciting view to take in. It is said that the site is so spectacular that former First Lady Eleanor Roosevelt, upon seeing it, exclaimed, “Poor Niagara!” Indeed, my reaction was exactly the same. All waterfalls in the world are beautiful with unique characters. However, after seeing Iguazu, all the other falls pale in comparison. Devil’s Throat – gives the appearance of ten thousand galloping horses. There are several ways to get close to the falls, including by helicopter and boat. A boat trip will take you beneath the falls, which makes it a thrilling experience! A footbridge can be crossed to view the Iguazu Falls from the Brazilian side. After Iguazu Falls, you can visit the nearby Parque das Aves, which is a privately owned zoo. This bird park is especially popular with children and contains more than 150 species of birds as well as other animals. Toucans are not scared of people. Take a selfie with these colorful birds! Located between Brazil and Paraguay, the Itaipu Dam is one of the seven modern wonders of the world, according to Popular Mechanics. Its hydropower produces 90% of Paraguay’s and 20% of Brazil electricity. The annual carnival parade is usually held in February, but you can experience samba shows in restaurants if you want to soak up the carnival atmosphere. Meat is cooked in a unique way throughout Brazil and is known as the “churrasco” style. It is roasted with charcoal, giving it a smoky and original flavor. Many parts of the cow are tasty, but filet mignon is considered to be the most delicious because the muscle is not as worked as other parts, making it less chewy. As a result, when eaten, it is tender and not at all greasy. All in all, Brazil is a country with explosive color and a wide range of festivities to enjoy. The people have unrestrained enthusiasm and are lively. It is jam-packed with spectacular tourist sites, and you will not regret immersing yourself in the culture as you travel through the country. I wish Brazil every success when it hosts the Olympics next month! I would love to visit Brazil but it is just so big I would need so much time!